The addition of rum, pureed pineapple, and ginger greatly improve this traditional recipe. 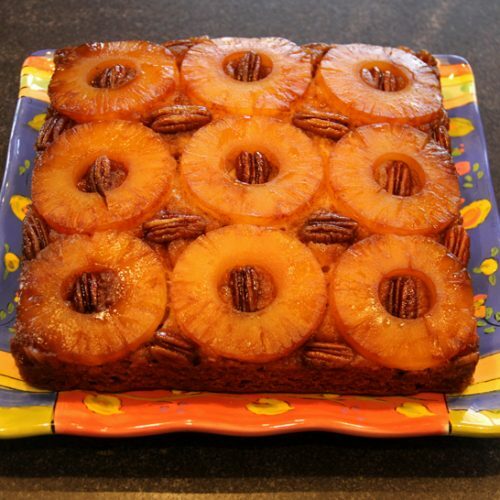 The yellow cake with pineapple and ginger has a topping of melted butter, rum, brown sugar, with pineapple and pecans. Based on a recipe from The Silver Palate Good Times Cookbook, Julee Rosso & Sheila Lukins, 1985, Workman Publishing, NY, p 87. Preheat oven to 350 degrees F. Line a 9-inch square baking pan with two sheets of foil that crisscross and overhang edges, so cake can be easily lifted out after baking. Pour melted butter into bottom of lined pan. Sprinkle brown sugar and rum evenly over butter. Arrange pineapple slices over brown sugar. Use pecan halves to fill empty spaces. Set aside. In bowl of a stand mixer, cream margarine and granulated sugar. Add eggs, one at a time, beating after each addition. Beat in vanilla. Using a blender or food processor, puree 3 pineapple slices with 1 tablespoon rum. Beat into batter in mixing bowl. In a separate bowl, sift together flour, ginger, baking soda, and salt. Beat into batter in portions, alternating with reserved pineapple juice. Spread batter evenly over pineapple slices in cake pan. Bake until golden and center springs back when gently touched, about 35 - 40 minutes. Remove from oven. While still hot, grab sides of foil, lift cake out of pan and onto a cooling rack. Immediately invert onto serving platter and remove foil. Serve warm or at room temperature with whipped cream, if desired. This recipe requires slightly more than one standard 20 ounce size can of sliced pineapple. Use an oblong cake pan and scale up recipe one and a half times for approximately 13 servings.